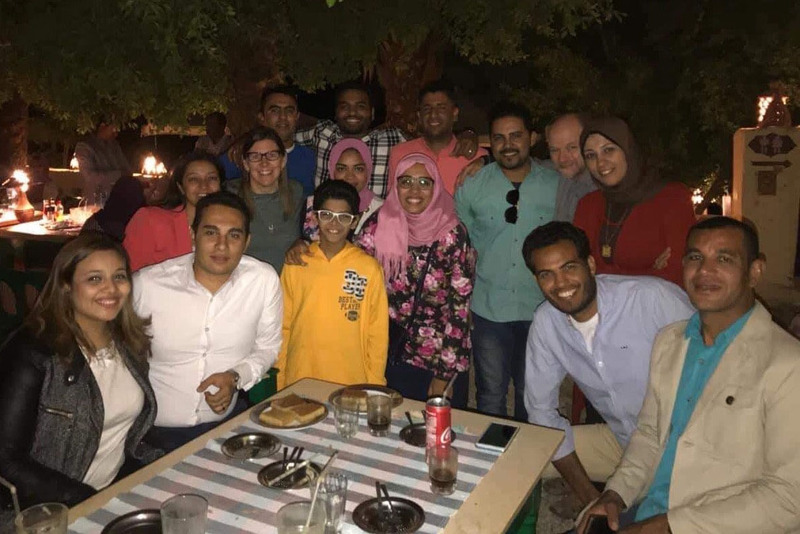 As in previous years, the graduation ceremony was scheduled to take place in the garden of Sheikh Ali, and once again we were given the privilege of taking over practically the entire restaurant to stage our ceremony. 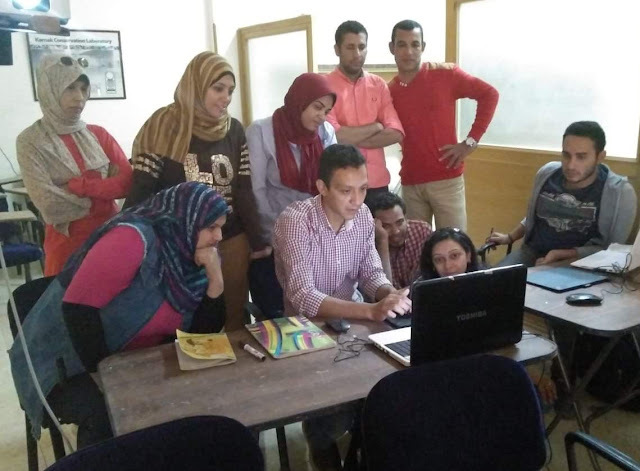 We were particularly pleased to learn that both Alaa Talaat and Rasha would be able to take some time away from Abydos so that they could join us and receive their certificates, and it was wonderful to have a chance for the whole group to be together again. 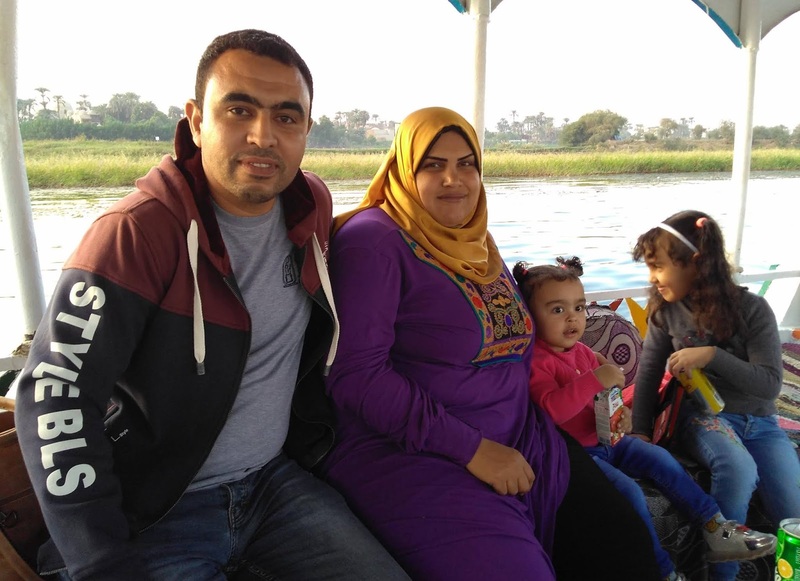 We were also happy to see not only our West and East Bank Inspectors Atito, with his young daughter, and Khadija, but also the full complement from the west bank teftish, including Fathy Yassin, Ramadan Ahmed, and Ezzeldeen El-Noby. Although we have had members of the teftish join us in the past, it was marvelous this year that they all came together to acknowledge the school as well as the success of the individual students, who of course are inspectors themselves. Having learnt in previous years not to linger, because dusk was falling, we began the ceremony straight away with Sayed announcing the names, Fathy giving the certificates to the students, Ramadan and Ezz shaking hands, Yaser and Hassan handing out drawing boards, JJ and Will presenting mugs, and Hazem handing out t-shirts – a real group endeavor! Even JJ's youngest son Declan, our budding archaeologist, joined the receiving line, seated at Ezz’s feet. Despite our best efforts, and perhaps because there were so many of us, the ceremony was completed in the dark, with the final graduation photo being taken in the pitch black. Even so, Marco was able to get an amazing image of all of us by lamplight. 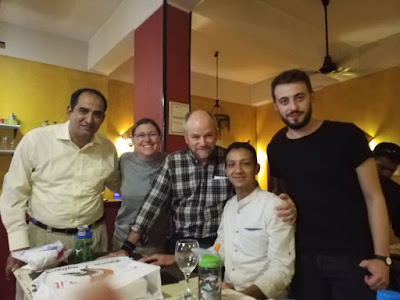 Once the group photo was finished, everyone returned to their tables, spreading out over the restaurant, to enjoy the mixed grill, salat, and aish being provided by the restaurant, along with various beverages. The highlight of the meal was the famous Sheikh Ali kofta, which seemed to disappear by the platterful as soon as it appeared! 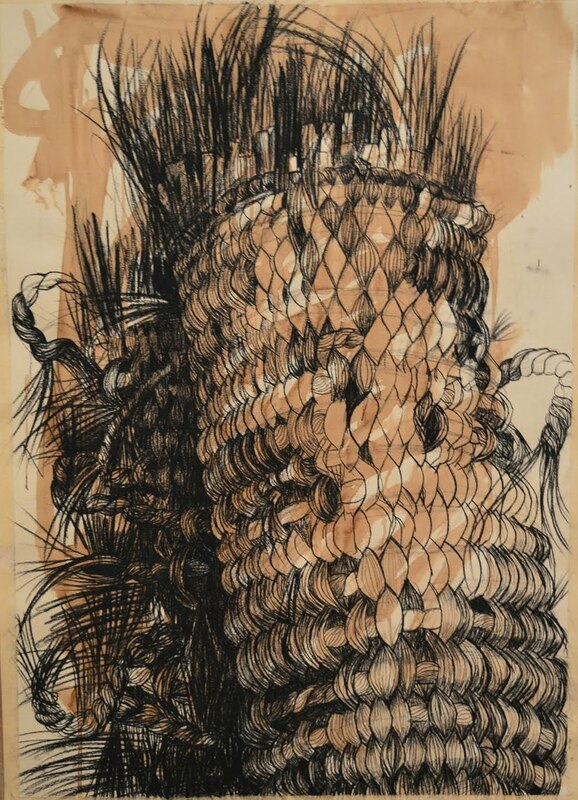 The groups mixed and changed their configurations over the course of the evening, as has happened in the past, with the children all running about. 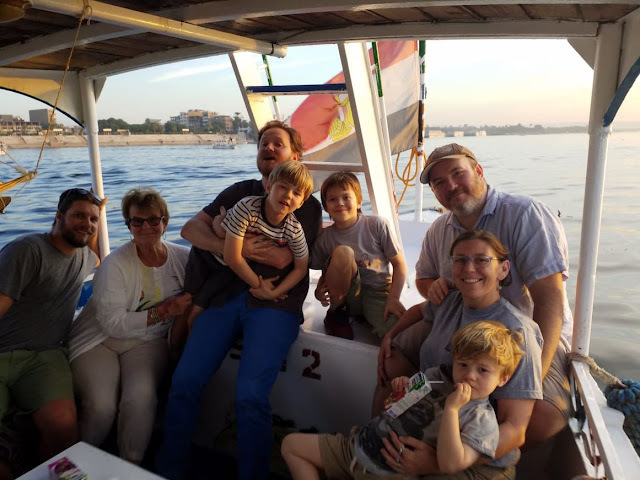 This year, a particular feature was having JJ’s family and children join in to share in the event, meeting not only the members of the teftish, but also the students and their families. 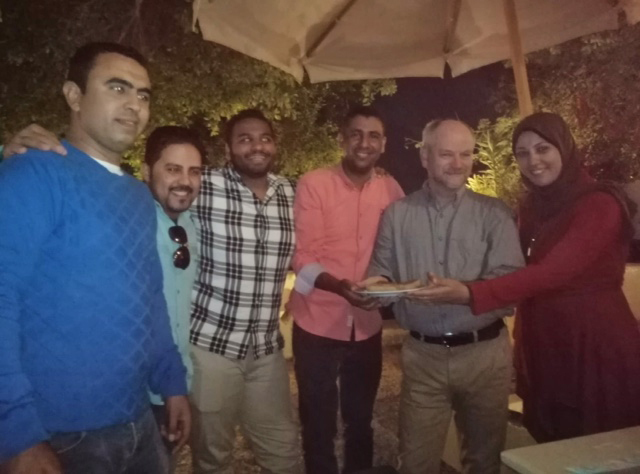 Mr. Will was particularly pleased to see the evening meal concluding with basbousa, and the students knowing his partiality managed to gather an entire plate to present to him at the end of the dinner! At the end of a long and wonderful evening, after the inevitable goodbyes, as in the past, we all piled into a variety of minibuses which took, it seemed, more than 30 min to depart. 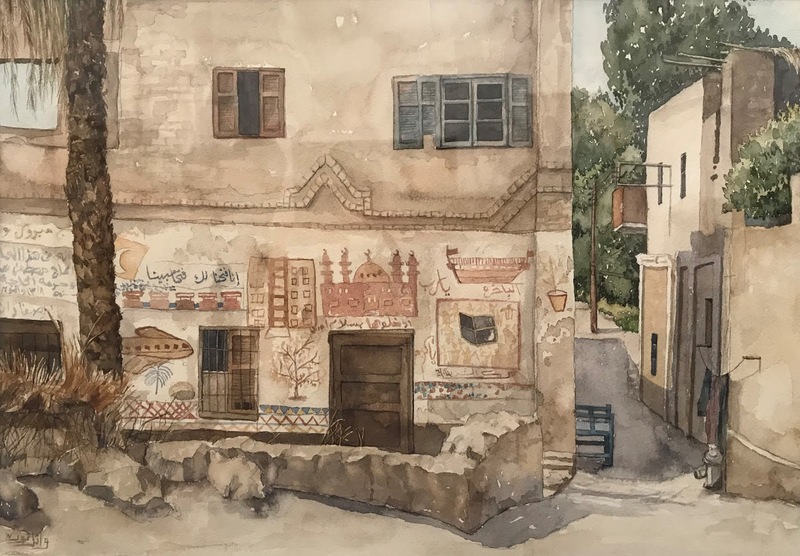 Everyone kept running off to say more goodbye, and as the doors finally closed there were still shouts and laughter between the minibuses before they separated to take the west bank families home, and the rest to the ferry landing so they could head back east. And once again emotional goodbyes as we all were reminded of the reality that we were saying good bye for the last time, and come the morning there would be no early boat trips west, second breakfasts, or group photos (alhamdulillah). Unbelievably, like the Bedouins in the desert, all the tents were taken down and by Friday morning all were embarking on their various journeys home. Hassan to Berlin, Marco to Florence, Will to London, and JJ and her family first to Cairo for a few days and then Philadelphia. Leaving an extraordinary memory of an amazing school and a wonderful group of students to take home with us. 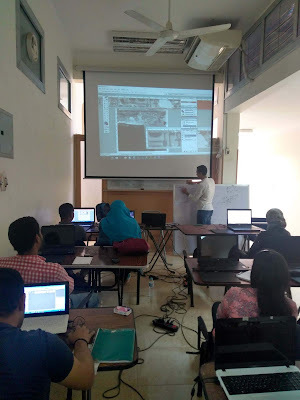 Those of you who have been following the blog may have noticed that there has been a slight interruption in publishing the events of the 5th, and last, week of the field school. We apologize! But as you can image with JJ’s family arriving events overwhelmed us, and Friday was the last opportunity to keep up-to-date, so that reporting on the subsequent week and graduation has been delayed until now. JJ spent the remainder of Friday with her family at Hazem’s, and Will spent the morning working at Chicago House and then partook of the lunch, having to eat JJ’s share of the koshari, as well as his own! 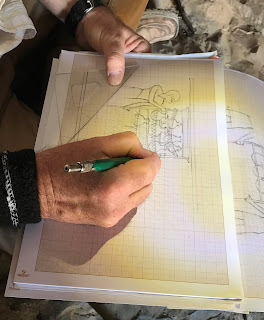 Will spent the afternoon with Marco going over the RTI photographs that Marco had taken and discussing the remaining plan for the photographic work. In the early evening we re-joined and JJ and Will played tour guides for the family and Marco at the Luxor Museum. 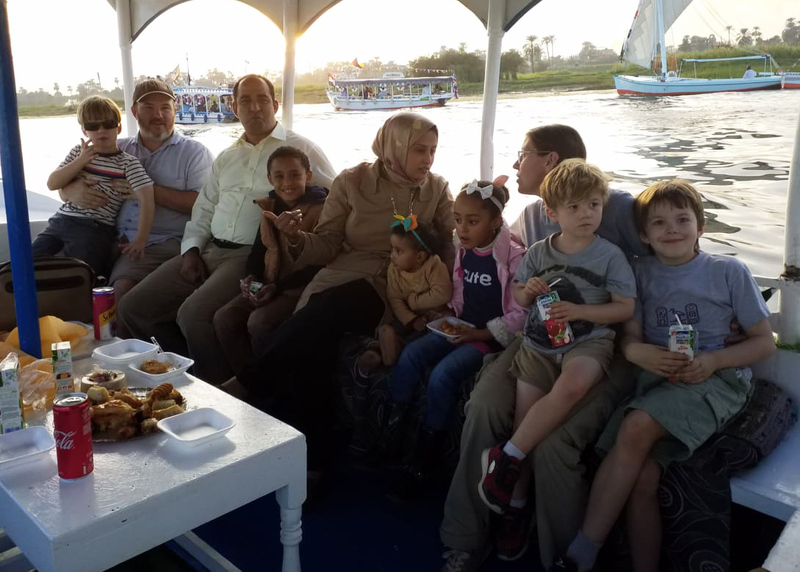 After the museum, all that culture demanded that we de-camp to an ice cream place with a magnificent view of Luxor Temple so that everyone could indulge in shakes, coffees, and colas. The hit of the evening was the strawberry frappe, which the adults were amazed was actually made of strawberries, and not syrup! After drinks were had, we headed over to visit the illuminated Luxor Temple after dark, where, for whatever reason, Hazem, Sayed and Marco obsessed about who was the tallest, and demanded a photo be taken in order to document the event. Though in fact Marco cheated a bit by standing on his tip-toes, so the result was invalidated! This gives you some idea of the silliness that had begun to overtake the project. 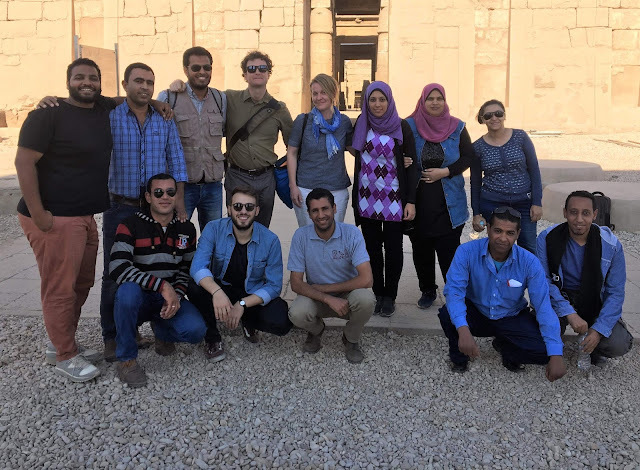 On Saturday, while Hassan resumed teaching at the lab, Will went with Marco and Hazem to TT110 to continue photographing in the tomb, and JJ took her family on a trip to Aswan for 3 days. With that day’s completed work, Will and Marco were free to join JJ and her family in Aswan a day later, for an end-of-season trip to Abu Simbel. The afternoon was spent at Hazem’s with a meal provided by his mother for all the boys: Will, Marco, Hassan, Sayed, and Hazem. It was a lovely opportunity for them all to get together over a working meal before Marco and Will left the next morning on the train to Aswan. On Sunday, Will and Marco broke their journey in Kom Ombo on the way to Aswan which allowed them to meet Will’s old friend Ana Tavares, but also our former student Sayed el-Rekaby who has been working on the de-watering project and currently is the inspector for the Austrian mission working at the Kom Ombo tell. 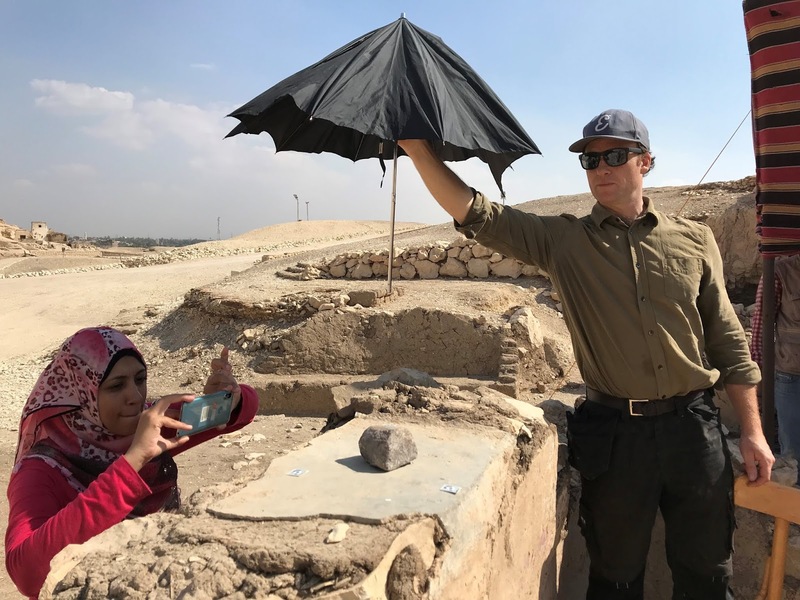 Sayed did us a proud by giving an excellent and insightful tour of his work as well as the temple’s archaeological history. Over the next several days Hassan carried on teaching the students digital epigraphy, with Yaser joining forces on Monday to provide a session on digitizing object and pottery drawings. 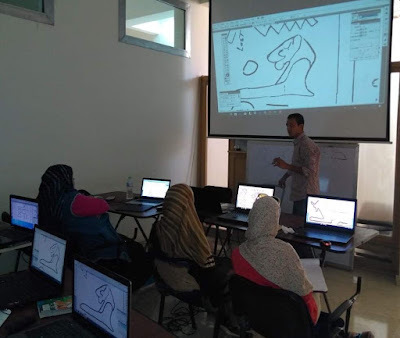 Hassan was also able to bring the students out of the lab for a really useful exercise in the blockyard, showing them something of the epigraphic problems they would encounter when trying to digitally draw from photographs. 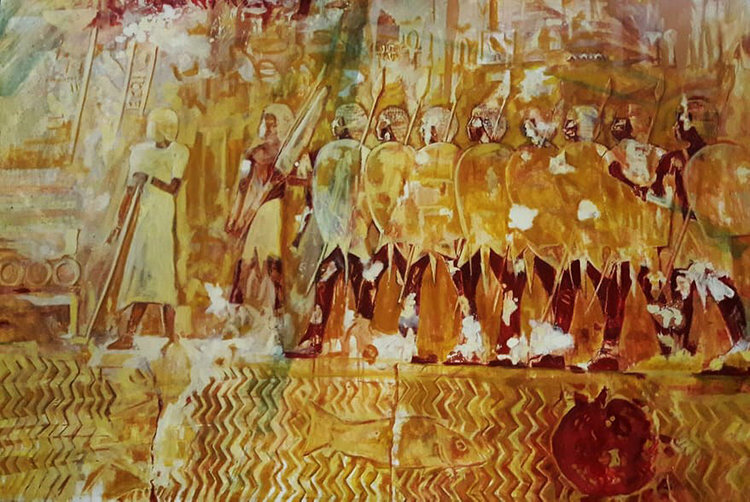 It allowed the students to truly appreciate the difficulties of working directly from photos of large-scale relief blocks. On Monday the Aswan group spent several hours touring the fabulous temples of Abu Simbel, leaving just enough time after our return to Aswan for the guys to see the Old Kingdom town and Ptolemaic temple on Elephantine, whereas Marco and Will slipped into the Nubian Museum, and JJ and the little ones relaxed poolside, before needing to head to the train station to catch the train back to Luxor. 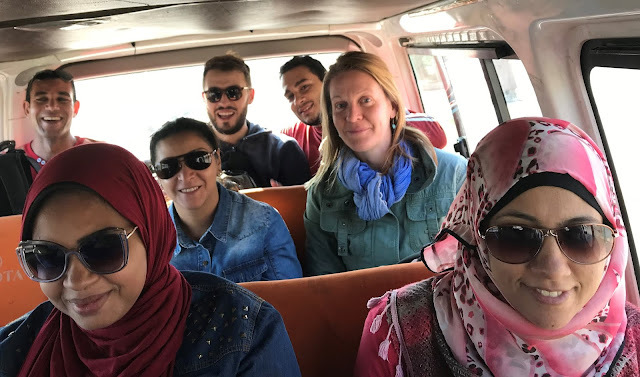 Various and sundry adventures were had in order not to miss the return train, which included convoluted taxi rides, joining the parade for the prophet Mohammed’s birthday, and commandeering a horse carriage. 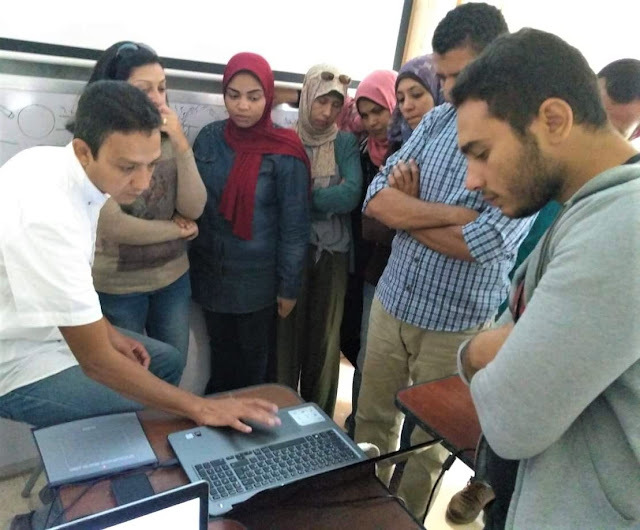 Unbelievably all three parties met in the tumult which was the Aswan railway station with 10 minutes to spare in order to find the correct carriage on the correct train going the correct direction! Safely back in Luxor, on Tuesday Marco, Will, and Hazem resumed photography in the tomb, awaiting JJ and her family. 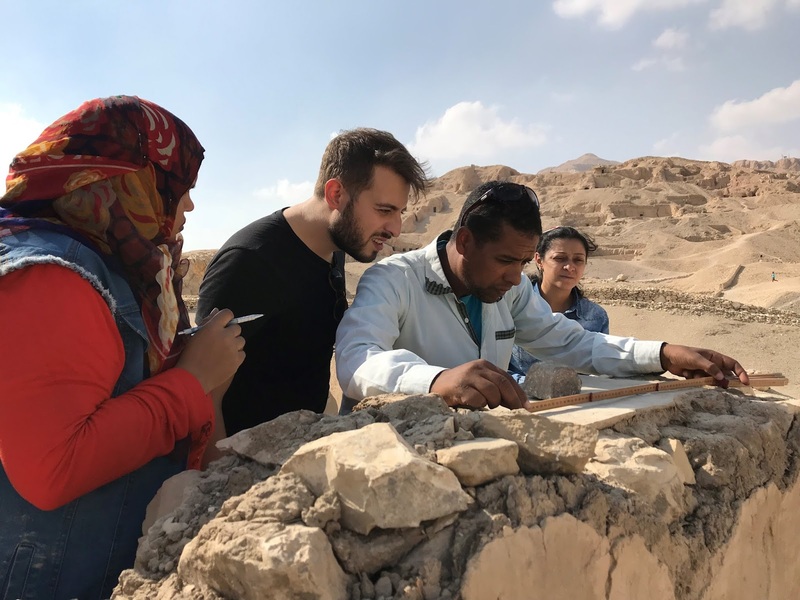 Arriving just before breakfast, in classic Egyptian fashion, JJ took the opportunity to give her family a tour of the work in TT 110, after which we could all take a break and introduce the family to the joys of tamayya, fuul, eggs, potatoes, aubergine, and karkaday tea. A delicious meal, and our last on the west, was had by all! 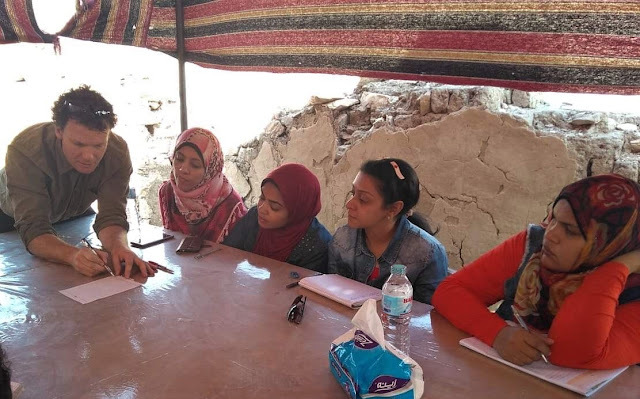 While Marco and Will went back to work, Hazem, JJ, and her family were last seen making their way over the ridge heading down into the valley of Deir el-Bahari, madly coating themselves with sunscreen, since visiting Deir el-Bahari in the afternoon is not recommended! It has to be one of the hottest places on earth, or at least it feels like it. Marco magically finished the last photographic detail for JJ literally with minutes to spare so that he and Will were able to call it a wrap at exactly 1pm! 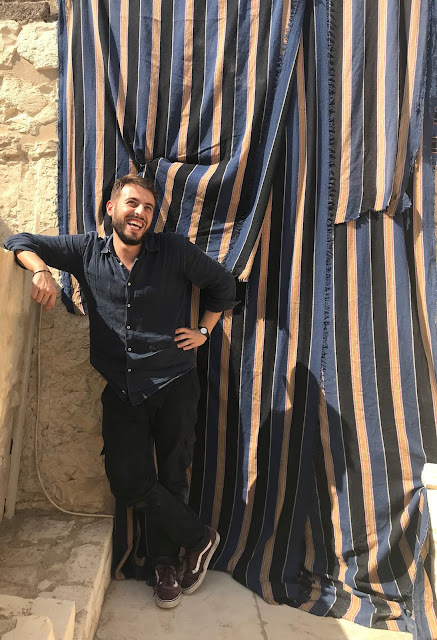 Marco admitted that now that he’s taken on American punctuality, he might not be allowed back in Italy, or at least his friends will tease him for always being on time. 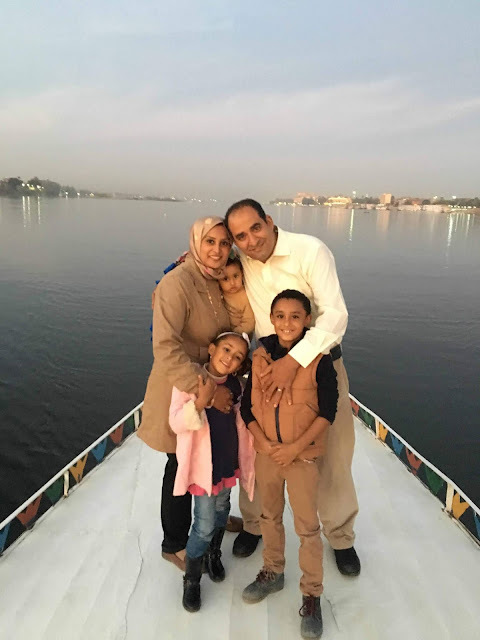 Later in the afternoon, at 4pm, everyone re-grouped at the ferry for a planned sunset boat ride on the Nile as a kind of thank you on behalf of JJ to the staff and their families, giving them an opportunity to meet her family. 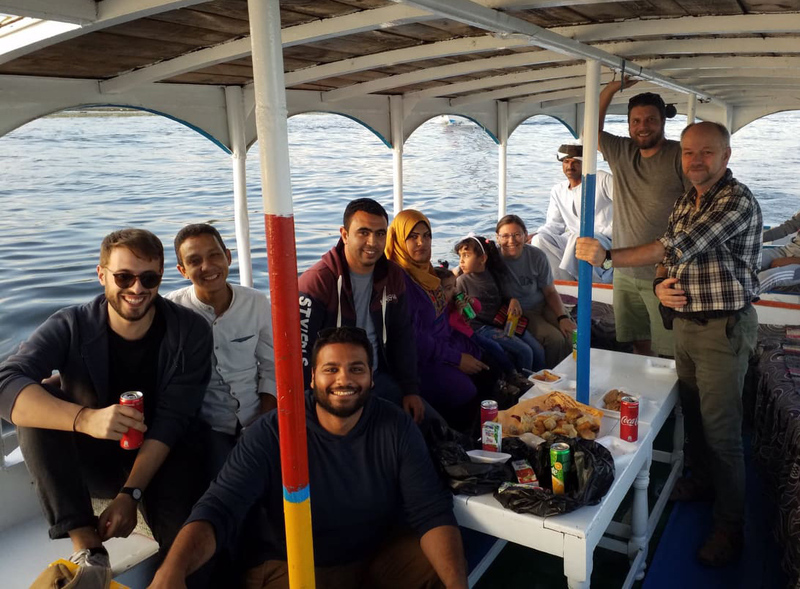 Sayed and his family, Yaser and his family, Hassan, Hazem, JJ and her family, as well as Will and Marco all crowded onto the boat to enjoy pastries and beverages, and we all settled in for a lovely cruise up to the infamous “Banana Island”, turning to make our journey back as dusk fell. The kids all had a riot, playing games, and eventually ending up on the roof of the boat, nearly giving all the parents heart failure. But, fortunately, the gods were smiling and all of the children returned safely to their parents’ arms by the end of the evening. In fact, the evening had been so pleasurable and the children had all had so much fun, the grown-ups decided why call it a night. So, although Sayed and his family had to return home, Yaser and his family were able to join us for dinner at Pizza Roma. Piling into several taxis, when we reached Pizza Roma we virtually took over the entire restaurant! But, Pizza Roma rose to the challenge and we all were able to sit between 2 tables, though this did not stop the children from roaming about, playing, and sharing their pizzas. As became clear, all children everywhere love pizza! 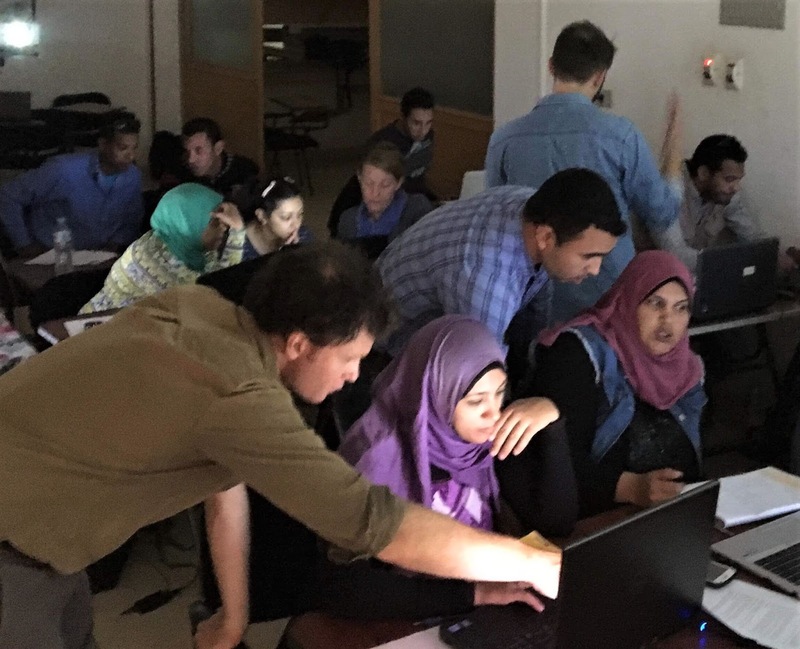 Although Tuesday evening felt celebratory, it was not actually the end of the field school – we still had one more day! 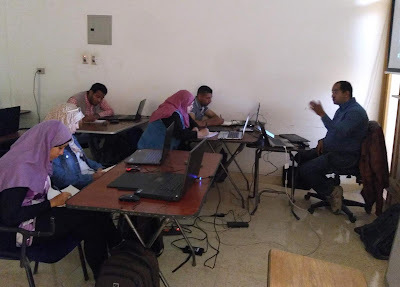 On Wednesday Hassan provided the individual evaluations of each of the students at Karnak Lab, where Will and Marco joined him. 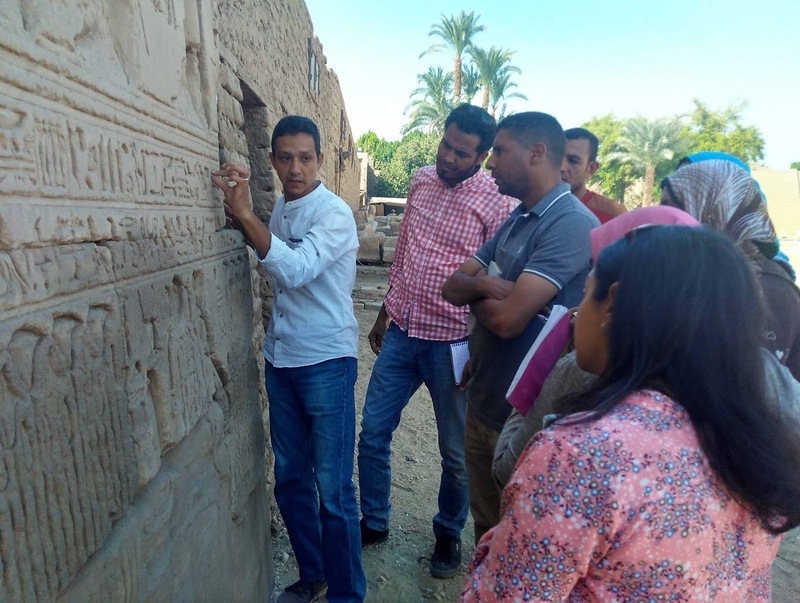 Meanwhile JJ and her family toured through Karnak for the morning, re-joining the field school for, you guessed it, second breakfast! This time instead of the usual fare we had a special final breakfast of fatir with sugar cane molasses, tahina, honey, and gibna abyad spread out over the table so that all could share. Yet another Egyptian delicacy and tradition JJ was able to introduce to her family – tearing off pieces of the flaky bread and dipping them into the various condiments, and finding that it was almost impossible to stop eating! Meanwhile, unbeknownst to JJ, her youngest son Declan had begun to excavate underneath the table, removing his shoes (but for some reason not his socks!) 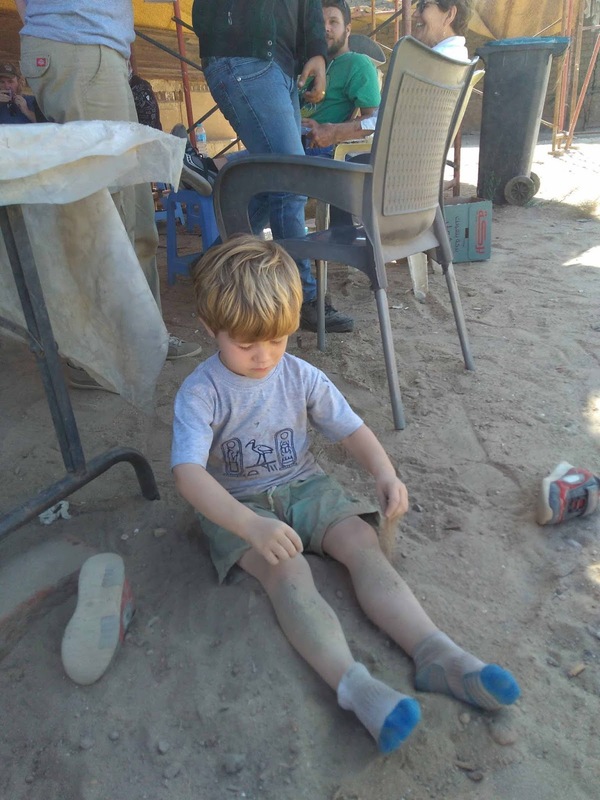 in order to get a better feel of the Egyptian earth, thus showing himself to be a budding “dirt” archaeologist. A real chip off the old block You will not be surprised to hear that after breakfast group photos were required, so the students and teachers posed outside the Lab for some final shots. Once this was done, JJ’s family was invited to join in for a few more photos. Hassan having, amazingly, kept strictly to schedule, after the breakfast and photos there was plenty of time for the students to return to their homes to get ready for the graduation celebration which was scheduled for the same evening at Sheikh Ali / Marsam. Seeing as the graduation ceremony involves so many photos, we will provide an additional blog entry to document this event, so stay tuned for the graduation ceremony celebrations! On Saturday morning, Will and JJ awoke to find a message from Alaa Talaat and Rasha, along with a photo of their first morning tea at Abydos. 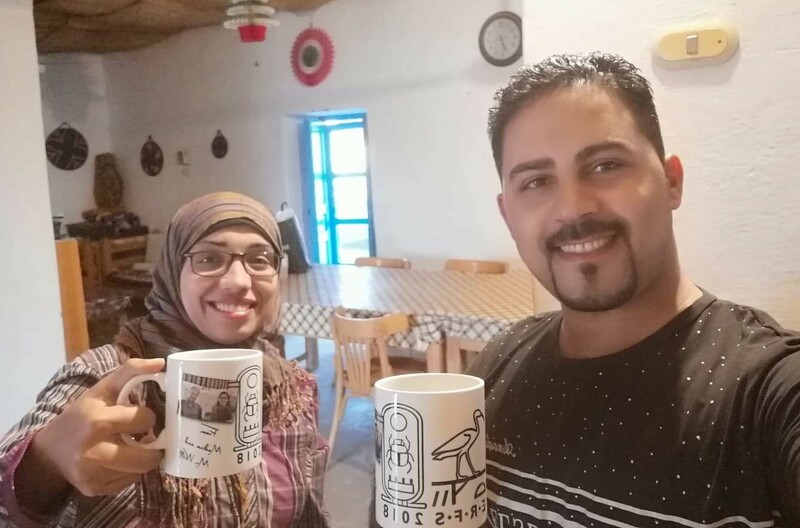 We were delighted to see they were using the mugs we had given them the day before. In fact, when we checked the time of the message, we realized we had been having our morning coffee at the same time! Marco Repole, our Italian photographer from last year, returned to Luxor on Friday night to continue his photographic program in TT 110. 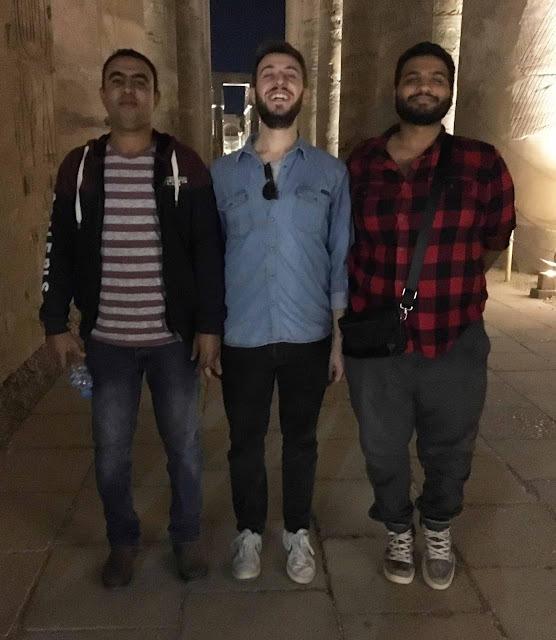 So, on Saturday morning, after finishing our coffee, we picked Marco and Hassan up from their hotel and all went together to Karnak so we could introduce Marco to the new group of students. 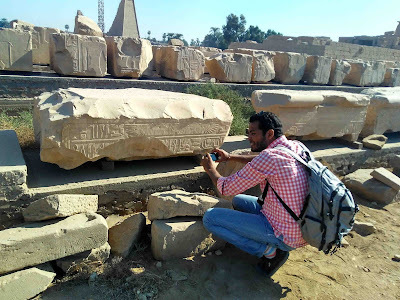 After teas, coffees, and introductions, we left Hassan to get on with the digital epigraphy teaching, and took Marco by boat across to the west and TT 110. We spent the remainder of the work day going through TT 110 with Marco, discussing the photography he would be doing and the plan for his work to make high resolution RTI (Resolution Transfer Image) photographs of the blackened walls from which we would try and tease out the images and inscriptions still covered by soot. Marco, with Hazem’s help, began a series of test photos, and we left with plans in place for the rest of the week. We left slightly later than the Chicago House group, so had to find our own back across the river, but we were fortunate to hop onto a leaving motorboat only to find an Egyptian friend, Mina Megally, whom JJ had met at the Halloween party and seen momentarily at the opening, already seated on the boat! Seeing as we didn’t have any small money, he kindly stood us the cost of the fare. A real gent! Back on the east, Ayman collected us from the ferry landing and off we went to Pizza Roma, unbelievably dead on time. 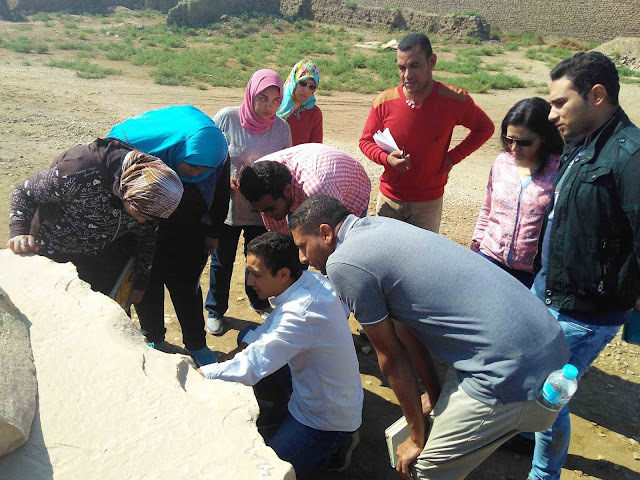 We had no sooner sat down than in walked the Karnak crowd: Bettina, Aurelia, and Maria, all ceramicists working on the pottery from Karnak. Maria we had only just met, but both Aurelia and Bettina were, guess what, old friends of Will’s, of course! As we were finishing up our delicious pasta and pizza dishes, who should walk in but the project director, Angus Graham, a delightful Scotsman, even down to the twinkle in his eye! Having found one another, promises were exchanged to try and fit in a shisha or a beer before both of our seasons ended. Sunday found our small group of Will, JJ, Marco and Hazem back on the west at TT 110, while our students continued at Karnak with Hassan and Sayed. The end of season dinner at Lantern with Keli and Jen was scheduled for the evening, and while unfortunately Jen was unwell, we went anyway! Hopefully there will be another opportunity of catching up with Jen before the end of the season. 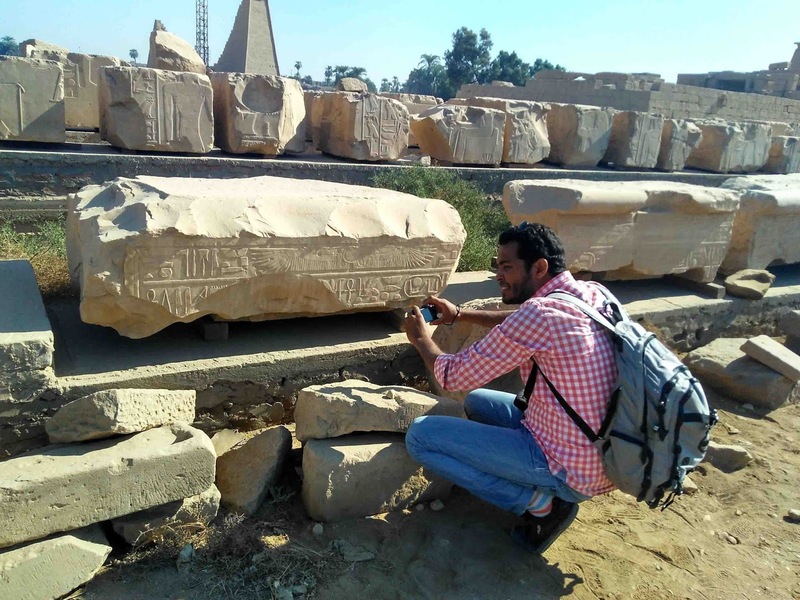 Monday we had arranged in the morning to have both Marco and Hazem stop by the flat first thing, in order to evaluate the sample RTI photos Marco had taken, so that we could be sure they would prove useful for further digital epigraphy work. 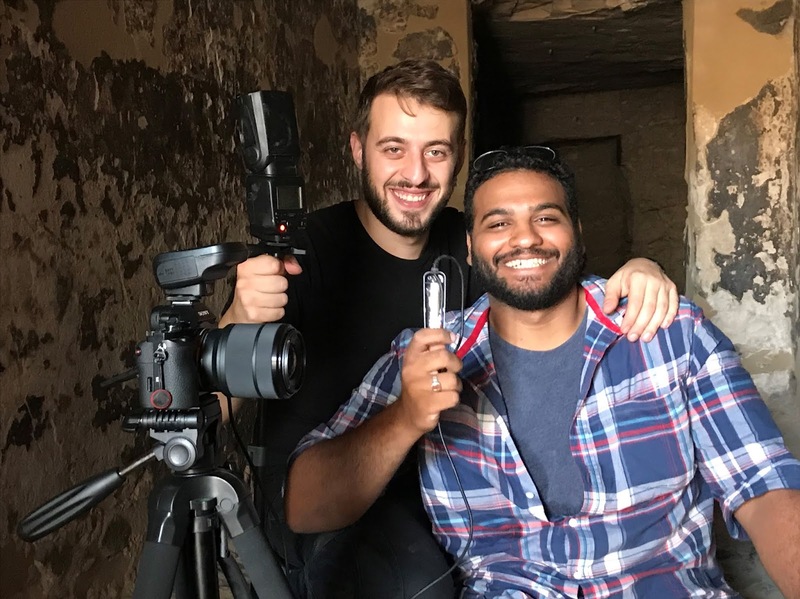 The results were amazing, with Will and JJ oohing, aahing, and exclaiming, and gave us both hope that results could be achieved via this technology. 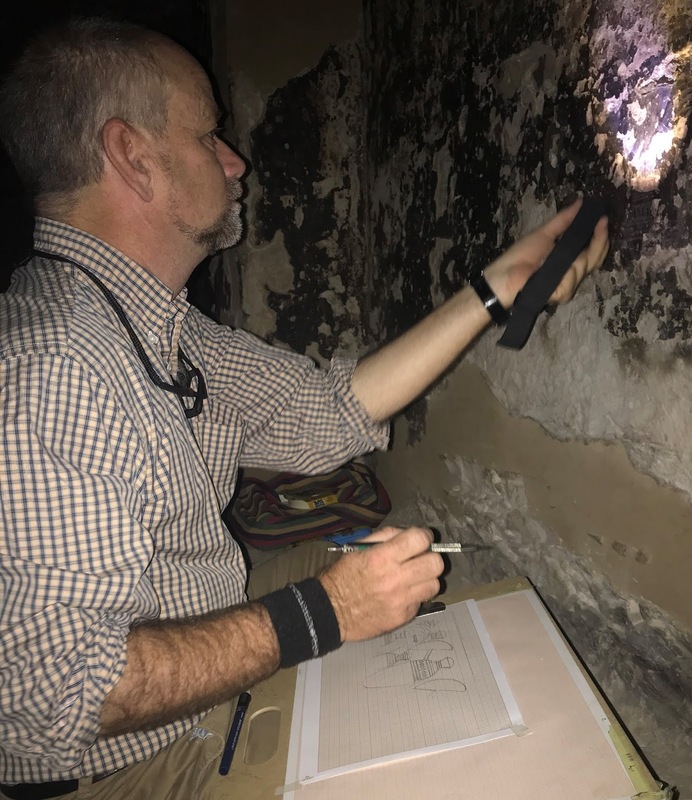 Full of renewed optimism, we headed back to TT 110 to look once again at the blackened walls in light of Marco’s photographic discoveries. While Marco, with Hazem as his assistant, set to work photographing one wall, Will and JJ began making hand-copies of another, with the idea being that these, in conjunction with Marco’s images, would enable us to digitally record the painted scenes. That evening all four of us celebrated the day’s work with shisha and beers at the Sunset Cocktail floating bar on the east bank of the Nile, directly across from the Etap Hotel. Wednesday found the entire group back on the west bank at TT110. It felt like “old home week”, with all of our students together again with us, if only for the day. 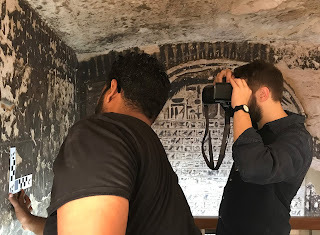 We collected Hilary McDonald and Owen Murray, who once again agreed to teach our students methods for photographing walls and objects using targets that would enable them to run the photos through the Photoscan program and create rectified images usable for digital epigraphy. Marco, as last year, assisted them with the teaching, and we split the students into groups of 3 in order to facilitate teaching the use of targets both in the tomb and with objects. 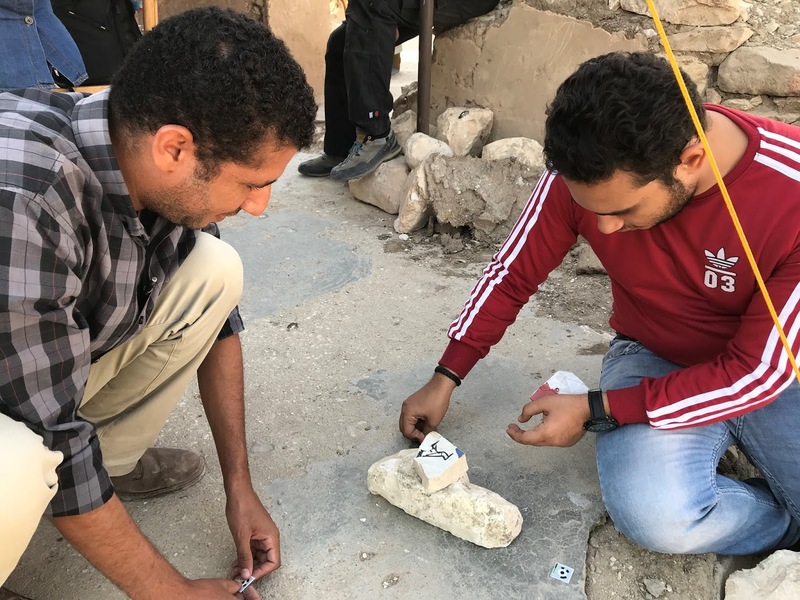 ARCE made a re-appearance, this time focusing on interviewing both Hazem and Sayed, who talked about their work for the field school and its importance for the training of Egyptian inspectors. On Thursday the students returned to Karnak, along with Hilary, Owen, Marco, Hazem, and Sayed, in order to work in the lab teaching the students to run their photographs through Photoscan, leaving only JJ and Will to go to the west. 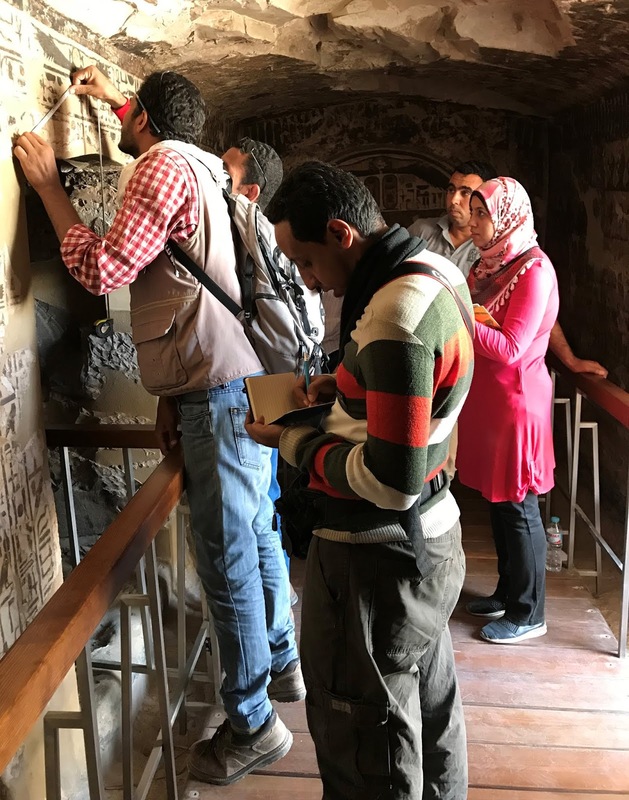 We spent the day completing hand copies of the north wall of the passage, finishing in time to meet the rest of the staff at Marsam for our Thursday staff meeting. Since for the previous week the school had been broken up into so many components it was a good opportunity for Hassan, Sayed, Yaser, Marco, Hilary, and Owen, to explain what they all had been doing and give their impressions of how well the students were understanding and progressing. This was particularly important for JJ and Will who had been only on the west all week, and for Yaser whose Scientific Center photographer had joined us over the last two days to obtain some additional photographic training. 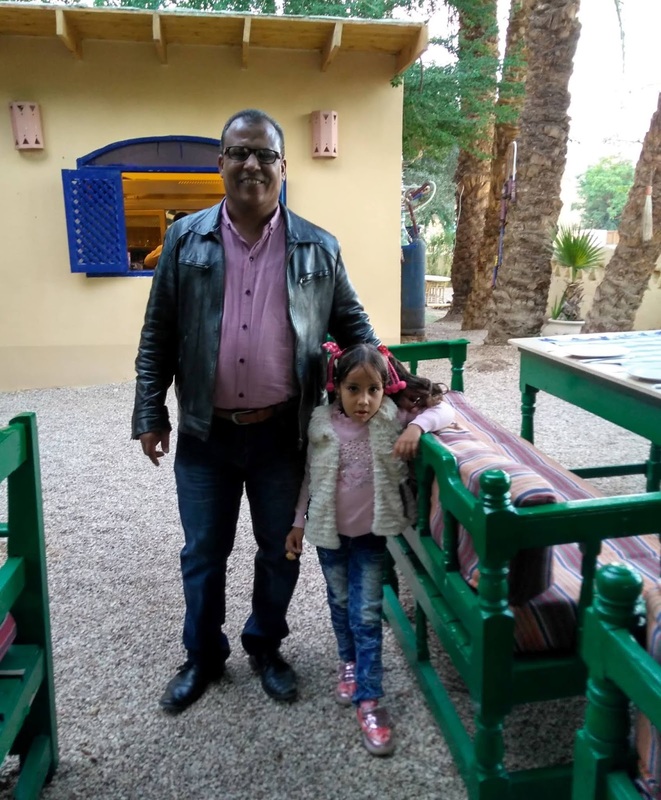 What was a relaxing as well as useful time in the Sheikh Ali garden had to be shortened somewhat when JJ realized that her family was soon to arrive at the Luxor airport and she needed to be there to welcome them. 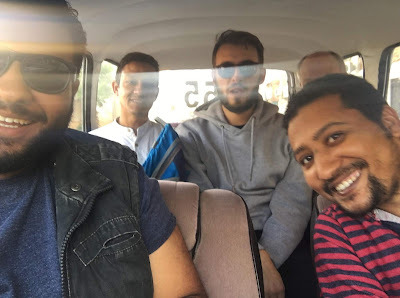 We all piled back into the bus and headed east to be met by Ayman and a second taxi and, after dropping of Marco and Hassan, make our way to the airport alatool. 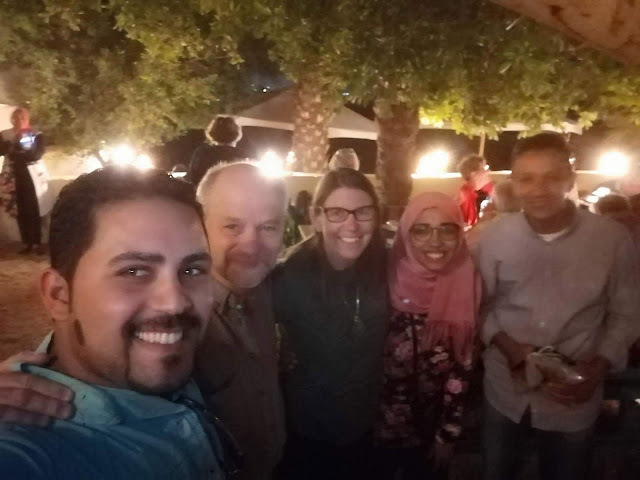 Thankfully everyone arrived happy, if tired, and with all their luggage, and were shepherded through customs by Hazem’s sister Ahlam who works there, and her colleagues. 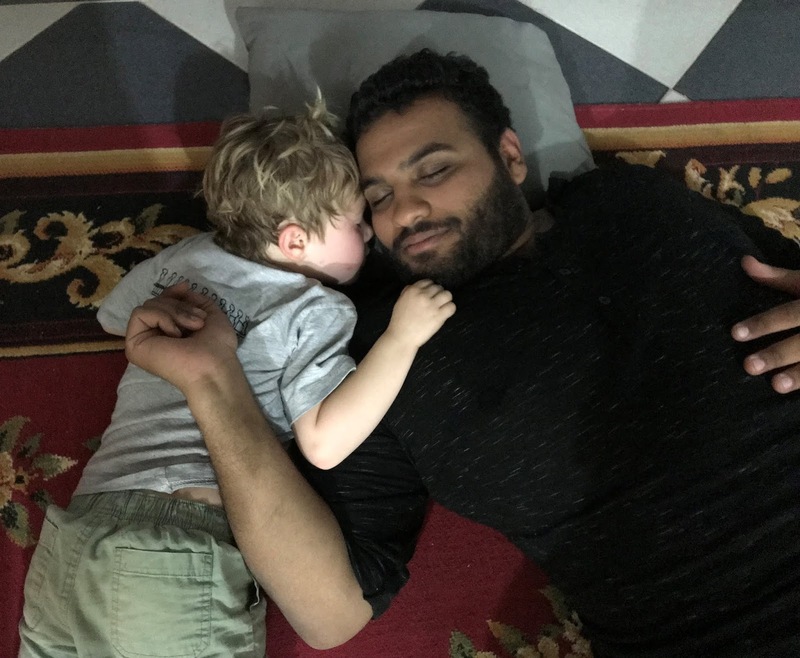 Excited and happy reunions were had, and after a feast laid out by Omm Hazem, everyone quickly dropped off to sleep. Declan didn’t even make it into his bed! JJ Shirley. Simple theme. Powered by Blogger.